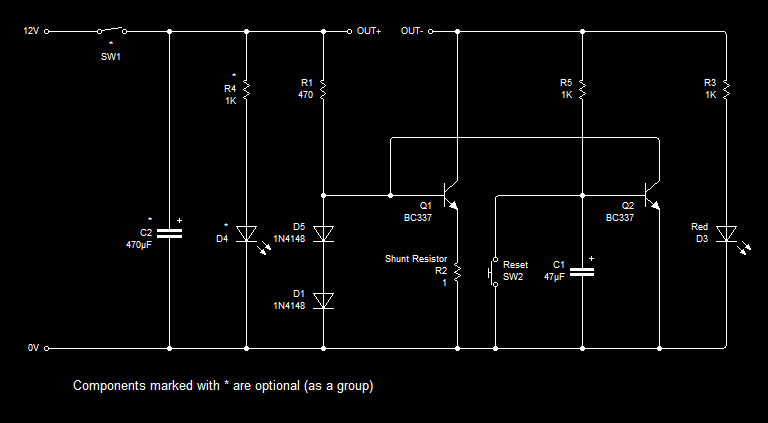 This is a very simple circuit, it’s purpose is to slowly switch on and off a load by the flick of, you’ve guessed it! — a switch. It’s not an engineering feat by any stretch of imagination, it is however my take on a problem the great Photonicinduction has been talking about on one of his latest videos. Being a big fan of his work I thought I’d give it a go and share my idea. Q1 and Q2 form a discrete darlington pair, which is driven by a R-C circuit comprised of R1 and C1. C1 is charged by R1 once SW1 is closed, when enough voltage is present to drive the darlington pair base, the transistors will slowly begin to conduct thus turning the load on. When SW1 is opened no more current flows through R1, thus C1’s stored energy is used to drive the transistors, once the charge is low enough on the capacitor the same start-up process will happen but this time in reverse; the load will slowly turn itself off as the potential between it’s leads is reduced to zero. The load can be up to 3A @ 12VDC with this particular setup (BD139 and TIP31C) – Which is to say 36 watts. You can find these components almost anywhere, if you can’t just scrap them from old equipment. You can use a proper darlington pair instead of two transistors, but seeing how those are harder to come by in scrap equipment I decided to use a discrete pair instead. Increase or decrease either C1 or R1 to change the charge and discharge timing. 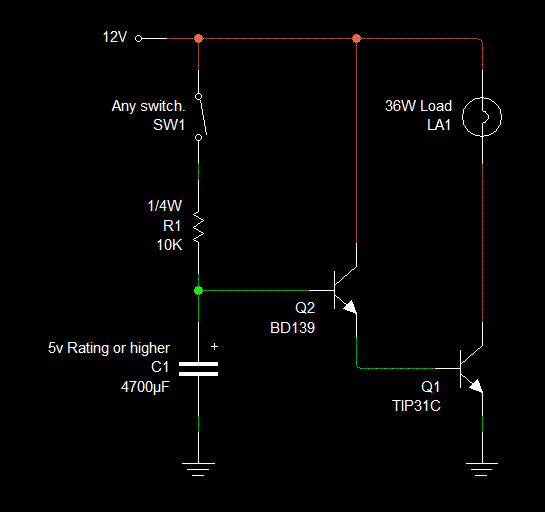 You may change R1 to 100 ohms and use a potentiometer in series instead to vary the timing. A MOSFET could be used instead, but generally speaking hobbyists often have a lot of BJTs whereas they only have a few FETs around, so that’s primarily the reason to use the good ol’ bipolar junction transistors here. I know they’re teaching more fets than bjts now adays but I don’t care, I think they’ve both got a place in this world and everyone should understand how they work. That’s it, very simple but I just wanted to share since it may come in handy for some people.